"Chapter IV" is a masterpiece of prose portraiture. In style, execution and energy, this transcends genre (19th-century realism, romanticism, modernism, magic realism, etc.) and can most easily and naturally be called great. If Whitman were born earlier, in Paris, and dedicated himself to prose fiction, this is what we would've gotten. Balzac sweeps his lens through the offices of the division and gives us more than fifteen human, familiar-to-life secondary characters sketched in just a few dozen pages - Billardiere's shadowy, haughty executive assistant La Briere; perspicacious head footman Antoine and his two nephews; weaselly mediocre Dutocq; aspiring writer du Bruel pen-named "Cursy"; useless taxonomy enthusiast Godard; genial academical Phellion; dissipated metrosexual Vimeux; the irrepressible Bixiou (who appears elsewhere in La Comedie to great effect), here seen as the office clown in his natural habitat; sincere, tired, industrious Minard; Colleville, anagrammatist-seer, and his work-husband Thuillier; flummoxed diarist Poiret the Younger (sibling to the more famous Poiret, retired pensioner living at Vauquin's boarding house in Pere Goriot); Fleury, half-crazed veteran Bonapartist maybe ready to go postal; Desroys, a quiet enigma to all, another kind of crazy entirely; and Billardiere's own son, vapid beneficiary of gross nepotism and a completely empty suit - each with histories, scenes from their home lives, aspirations, physiognomies, peccadillos, beliefs, habits, each adding interlocking facets of detail to the workplace's tapestry, and, consequently, as Balzac says himself, the design of the larger world. White-hot prose tours de force like this give you a real sense of not only the breadth but also the depth of B. 's entire canvas. La Comedie is frankly dizzying in its scope, as massively comprehensive in its (highly readable) way as Proust's La Recherche, Tolstoy's War & Peace and Faulkner's Yoknapatawpha, and acknowledged parent to each of those: and chapters like this are wonderfully illustrative of why it's worth it to immerse yourself in Balzac's work beyond just the two or three traditionally-touted novels. Definitely not on the level of Pere Goriot or Lost Illusions, but a very entertaining tale that's likely to be overlooked even by dedicated fans.Here are some quotes. I hope they give some examples of Balzac's style. 52: a char's biz: "discounting commercial paper" 55: "...Isidore was nothing more than a bureaucrat, incapable as bureau chief, but a man of rote molded to routine, who concealed the fact that he was a fat incompetent under a skin so thick that no scalpel could cut deep enough to expose him." 61: "The supernumerary is to the Administration what a choirboy is to the church, what the company's child is to the regiment, what the understudy is to the theater: someone naive, innocent, a being blinded by illusions. Without illusions where would anyone be?" 89: "His wife is surveyed by the intricate spy network of small towns, and if it is unhappy from within, he knows about it, whereas in Paris, state employees can be oblivious." 109: "Expert in legal matters, [Fleury] never signed a promissory note and had his own wages garnished under the names of fictitious creditors, so that he was actually able to draw nearly the whole of it himself." 152: "Dutocq disappeared." - a two-word paragraph that somehow suggests a lot about how this guy moves. 154: Balzac, faking newspaper prose, employs extraordinary syntax: "No rewards have ever been more truly deserved than those with which King Louis XVIII and His Majesty took pleasure in crowning a loyalty that never faltered under the usurper." 160: "Through the windows Elisabeth saw the faces of Gobseck and her Uncle Bidault, which stood out against the bright-yellow background of the old cafe's paneling like two cameo heads, cold and impassive in the rigid mien their engraver had impressed upon them. These two avaricious Parisians were surrounded by old faces on which 'thirty-percent discount' seemed to be written in circular wrinkles that started at the nose and came up around the glacial cheekbones. These remarkable physiognomies brightened up on seeing Mitral, and their eyes gleamed with tigerish curiosity." 168: "[Des Lupeaulx] was feeling the beat of what little heart he had when, on the staircase, he ran into his lawyer..." 194: Love Balzac commenting on the sublimity of sentences he himself invented: "Only the spirit of the usurer could have inspired a sentence so insolently imperative and cruelly irreproachable, so clear and curt, saying all and betraying nothing." A strange creation. 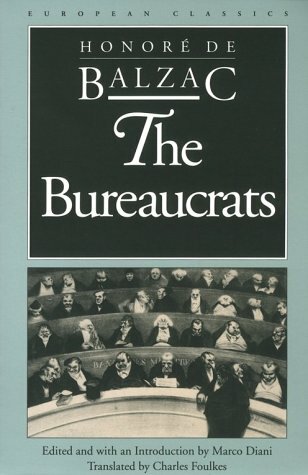 Part study, part Platonic dialogue, part novel, it all adds up to a fascinating, but uneven, literary artifact.The Bureaucrats is Balzac's study of the French bureaucracy under the reign of Charles X in the 1920s. It begins with about 100 pages of essentially prefatory material that serially introduces the dozens of characters that populate this novel, explaining where they came from, what role they play in the bureaucracy, and what their plans for the future contain. There are little bits of storytelling in the first part, but mostly Balzac is setting up the story--which takes up the next 150 pages of the book.It can be hard to keep track of all of the kaleidoscope of characters, bureaucratic positions, and machinations, but the basic story comes through increasingly clearly. The division director dies and needs to be replaced. Two bureau chiefs are jockeying for the position. The Minister has to make the decision, but mostly delegates it to his fixer, the Secretary-General, who himself is mostly focused on sleeping with one of the bureau chief's wives, getting out of debt, and becoming a Deputy. A large cast of bureaucratic underlings play an important role in the adroit and impressive machinations of the two camps. Ultimately, the good bureau chief loses out and the one who it would be overly generous to describe as a mediocrity ascends one rung up the ladder to become Division Director.All of the characters are recognizable and are presented as much as types as they are as individuals, but all of them are also unique and come to feel like individuals, albeit ones that generally do not evolve over the course of the book. In that way, it is typical Balzac, although the ratio of "types" in a study to characters in a story is higher in the case of The Bureaucrats", which has no one, for example, that approaches Lucien de Rubempré of Lost Illusions and A Harlot High and Low.Much of the book feels strikingly modern, including the discussions of tax reform (the reformist division chief favors a broader base with lower rates),government reform (he favors consolidating departments, although interestingly dramatically reducing staffing and dramatically raising salaries--which is not a view I associate with anyone today), and bureaucratic infighting.I would not recommend this as the place to start with Balzac or even as a particularly great work, but it has a lot of greatness in it and makes for an interesting addition to Balzac's universe. Hmm, this is the first of Balzac's stories that I've found boring. Long swathes of text about the arcane workings of the Paris bureaucracy (some of which I skipped) and he took too long to resolve the only bit that was interesting, the fate of the luckless Rabourdin. Balzac. Such a good man.Good taste in women also.Quotes:- (...) both among employees and artists there are far more miscarriages than offsprings, which leads us back to Buffon's sentence: "Genius is patience".- (...) he thought himself a handsome boy and had all the faults of high society without having the merits.- In front of these weird subjects it is difficult to judge whether the job has made them idiots or they do this job because they were born idiots. Perhaps responsibility must be divided equally between nature and government.- (...) should set a prize for those who solve this puzzle: what is the best organized state? The one that makes a lot of things with a few employees or that which makes a few with many employees? Altro mattone della grande casaPiù ci si addentra nella lettura della Comédie humaine più si rimane incantati dalla grandiosità del progetto balzacchiano, che è sicuramente il più ambizioso tentativo di descrivere letterariamente una società ed un'epoca.In questo episodio i protagonisti, come dice il titolo, sono gli impiegati, dirigenti, funzionari e lavoratori della pubblica amministrazione francese dell'epoca. E' straordinario come Balzac riesca a imbastire una storia che è in grado di rivelarci tutte le bassezze, gli opportunismi, le stupidità, i piccoli e grandi tradimenti del microcosmo impiegatizio. Quasi una metà del libro è impiegata dal nostro per introdurre l'ambiente e i tipi umani che saranno protagonisti della storia: questo rende Gli impiegati un libro insolito, per lunghi tratti quasi un saggio descrittivo di caratteri e modi di pensare.La storia, poi, si dispiega in tutta la sua grande piccineria, e come al solito Balzac non fa sconti a nessuno: ancora una volta sarà l'interesse, l'ambizione per il potere ed il desiderio di denaro a decidere il destino dei protagonisti. Se lo sguardo di Balzac si posa questa volta sulla piccola borghesia, le motivazioni e i meccanismi che muovono i comportamenti e le relazioni personali e sociali non sono dissimili da quelli che in altri romanzi egli pone a carico dell'aristocrazia, della grande borghesia o delle classi subalterne, dell'insieme di quella società che egli ritiene ormai irrimediabilmente corrotta dall'avidità e dalla volgarità. All in all, this was a tough book. I am not in general a huge fan of French literature and I did not have the background to fully appreciate his plays on words and French culture. That being said I found this book had some cutting insight about bureaucracy and the culture of anti-innovation it breeds, as well as a concise understanding of political thought that still dominates US policy discussions. That being said, a lot of the writing was slow, meandering, and plain boring--perhaps reflective of the subject matter. In any event as a stand alone, the book gets a low rating though I feel it was a poor choice to start in the human comedy and I hope to give one of the better known pieces of the collection a try. This is not one of my favorite Balzac novels, but it isn't bad. Perhaps it is more impressive in the insight it puts forth about the nature and ascendancy of bureaucracy, but that doesn't interest me much. I'm in it for the literature, not the history/sociology/whatever. Balzac does have a slight tendency in this novel to have his characters be mouthpieces for his thoughts about bureaucracy. That gets old. Still, in what for Balzac is a relatively short novel he brings in a host of delightful and well-rendered characters and uses them to tell a curiously compelling story. Even with the soapboxing, it is still an enjoyable read. Balzac knows how to describe men and humanity and his description of bureaucracy excels in perfectly exposing the pettiness, corruption and idleness of the giant, sprawling institution and the always-expanding number of its clerks. A great, pleasant work to read, if not sickening for the veracity of Balzac's analysis. Balzac never ceases to amaze me in his descriptive abilities. His character portraits in this work actually brought a tear to my eye - not tears of sadness mind you, but tears of unbridled joy! Hurrah! I put off reading this novel for years thinking that it would be rather dull reading. Not so. Confusing at times with all the plots and schemes, but not dull. Honoré de Balzac Marco Diani Charles Foulkes - Honoré de Balzac was a nineteenth-century French novelist and playwright. His magnum opus was a sequence of almost 100 novels and plays collectively entitled La Comédie humaine, which presents a panorama of French life in the years after the fall of Napoléon Bonaparte in 1815.Due to his keen observation of detail and unfiltered representation of society, Balzac is regarded as one of the founders of realism in European literature. He is renowned for his multi-faceted characters; even his lesser characters are complex, morally ambiguous and fully human. Inanimate objects are imbued with character as well; the city of Paris, a backdrop for much of his writing, takes on many human qualities. His writing influenced many famous authors, including the novelists Marcel Proust, Émile Zola, Charles Dickens, Gustave Flaubert, Henry James and Jack Kerouac, as well as important philosophers such as Friedrich Engels. Many of Balzac's works have been made into films, and they continue to inspire other writers.An enthusiastic reader and independent thinker as a child, Balzac had trouble adapting himself to the teaching style of his grammar school. His willful nature caused trouble throughout his life, and frustrated his ambitions to succeed in the world of business. When he finished school, Balzac was apprenticed as a legal clerk, but he turned his back on law after wearying of its inhumanity and banal routine. Before and during his career as a writer, he attempted to be a publisher, printer, businessman, critic, and politician. He failed in all of these efforts. La Comédie Humaine reflects his real-life difficulties, and includes scenes from his own experience.Balzac suffered from health problems throughout his life, possibly due to his intense writing schedule. His relationship with his family was often strained by financial and personal drama, and he lost more than one friend over critical reviews. In 1850, he married Ewelina Hańska, his longtime paramour; he died five months later.